After the Mk 2 video, I suppose everything else will seem like peanuts. Stepping out into the bright sunlight I had to force myself to realise this was the real world. 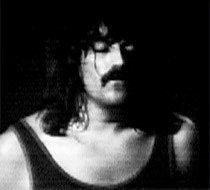 Gillan would be at Reading (with Black Sabbath), Ritchie and Roger were shortly to tour in Rainbow, Jon Lord was busy preparing for another Donnington set (with Whitesnake) and lan Paice was somewhere miles away touring with Gary Moore. In the room I'd just left time had stood still for ten years, and for a couple of hours Deep Purple Mk 2 had been back together again. To be honest the jolt at seeing them once more took me some time to get over. I had to keep telling myself that this all happened a decade ago, though it was frightening just how easily eveything that has happened since was wiped out in a matter of moments as a TV screen flickered into life. 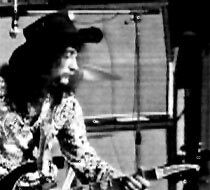 The concert was filmed on March 1st 1972 in Copenhagen, Denmark. The recording was done by Danmark Radio, and is in black & white - it seems unlikely that the original is in colour as the first test card comes up in full colour, before reverting to black & white. Machine Head had been finished, and the group had started to tour with a set which would see them through to the end a year later, with but minor changes. It's an extremely clinical and unsympathetic recording, the sort of stuff we got all the time on Disco 2 / Old Grey Whistle Test. Static cameras, boring shots, close ups of the wrong guys during solos - you know the type. Yet still they shine, and the viewing left me drained 1 hour 58 minutes after it had started. Things begin with the group arriving on stage. "We've got the telly here tonight so we gotta be good" lan tells the amazingly young looking audience, as they launch into a long tune-up. "Off the next LP" comes the opener - HIGHWAY STAR. The sound recordist is slow to react, Gillan way up in the mix, Ritchie hard to hear - though Lord does most of the work anyway. There is some trouble with a bouncer too and after a warning lan nearly alters the shape of the guy's head with his mike stand. 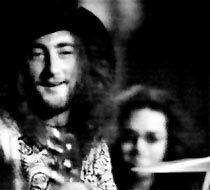 Behind him lan Paice is blazing away - getting the best of the mix. Into STRANGE KIND OF WOMAN and he is still sounding superb. The camera holds on him, as he makes it all look so effortless. The guitar / vocal duet is superb, although the cameras manage to miss most of the action. Ritchie is finding his form already, and battles it out before lan's mammoth scream rends the air. Next comes an amazing CHILD IN TIME. It's a brilliant rendition, and (along with the next number) appeared on a cassette some time ago - so at least two numbers must have been aired publically at some time. The cameras concentrate rightly on lan, and as he reaches the screams it sounds like he's been saving himself just for this part, the number really taking off. 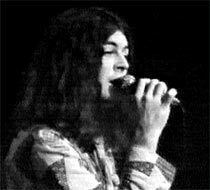 After he's finished the song drifts into the lengthy instrumental passage dominated by Jon, his hands filmed in close up, fingers drifting along the keyboards. He tries to entice Ritchie into things, and finally suceeds in doing so, the number getting close to Mandrake Root at one point. 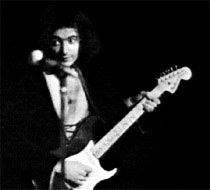 The camera pans across the stage, catching Gillan at the congas, and reaches Ritchie just in time to see the strat come whistling over his head for some furious palm bashing on the neck, and a ferocious look in his eyes that I'll never forget. Back into the second verse, the mix being held back on the vocals until lan gives his first scream - the TV set almost fell apart at the seams; The song belts to a close with the customary "if you're only three feet tall" ramble over the top. One to savor. THE MULE catches Paice from every angle with a good solid solo, a little more laid back than some but enough brill playing to keep all his fans happy. He gives Roger the nod towards the end, and Glover powers back in catching the soundman on the hop, his Rickenbacker blowing all the fuses in the house. LAZY follows (it was this together with Child In Time which are on that tape), and the TV guys are finally working out who plays what, so we find Lord hunched over his Hammond with the Leslies in full flight, drifting slowly towards the tune, without any of the heavy reverb crashing which characterises the Made In Japan take. Ritchie is seen doodling, trying to catch the others out, sharing an in-joke and we're off. It's a brilliant version. lan's verse over Ritchie lays down a beautiful mellow guitar solo, with the crystal clear sound revealing every last touch of the strings. The track isn't as long as it should be, and we're into the last leg of the set with SPACE TRUCKING. 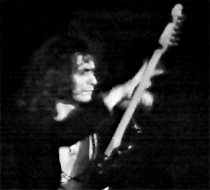 This contains the best footage of the whole set, especially of Blackmore. Lordy kicks in a couple of classics as well as some strange improvising before Ritchie is let loose, giving his home-made tremelo arm some real mangling, recalling one of my most vivid memories from the Sheffield gig the previous year when he dragged the arm round and round and round. Staggering. He gentles down a bit with a quiet solo leading into the Fools sequence, closing with a touch of feedback. There is one tremendous close up shot of his face in absolute heaven, eyes closed, head pressed up against the amps as he lets the machine take him where it will. Sudden silence as the crowd are caught unawares, before erupting. 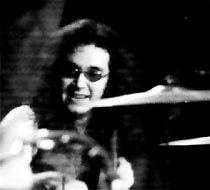 Paice is looking about smiling, the band judge it just right as they crash back in to the final climax. At times this drags when there is just the sound, but with visuals it all makes sense. Ritchie prowls about like an animal, as the two lans both flail away in a mass of hair. 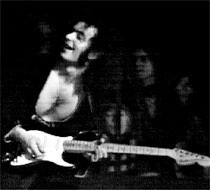 Without warning Ritchie explodes into action and the black strat goes hurtling into the air above the camera and crowd, he catches it, does the backside with it and sets it on the stage for a quick foot dance before grabbing it up and signalling to Jon across the stage. Up the PA, hurling around by the neck, it finally gets laid to rest on the amps feeding back. 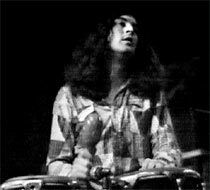 On the other side Roger is trying to push over his cabs, Gillan shoves his congas over and Jon finishes the number with an almighty crashing chord. There's a long pause. Roadies are seen scurrying about, but not until the band are returning do they wheel out an extra bass drum, which of course heralds FIREBALL. It's not quite as hectic a version as some we've heard, but Paice plays a blinder. The second the bass drum is in place he just goes beserk, I've never seen anything like it! The others look on in amazement and it's some time before they latch on to the number. It's fairly short too, and they break into more familiar ground with LUCILLE. This lacks the nice In Concert type intro but does feature the unique sight of Ritchie duckwalking across the stage! Blink and you'd miss it though! It's over all too soon. Vision fades. I was just about to switch it off when the picture suddenly returns as the band return for a second encore, and predictably enough it's a pounding version of BLACK NIGHT. That really is it, a remarkably good performance captured for posterity. The show is also available on the remastered EMI DVD Deep Purple 'Live In Concert 72/73', available from the dpas online store.